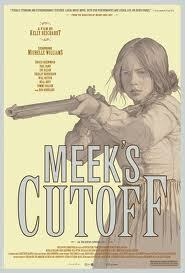 Meek’s Cutoff, if nothing else, is a meticulous and gorgeous film. Following three families and their guide making their way along the Oregon Trail in the covered wagon days, the film is nothing but scenic prairie land and sky. There were quite a few shots of clouds rolling across the night sky that were simply beautiful. As a story, Meek’s Cutoff is a little difficult to review. It almost seems more like a documentary rather than a narrative-driven film – there are many dialogue-free scenes of the group just doing chores and making their way across the trail. It’s really kind of unrelenting when it comes to portraying what life was like back then and it isn’t afraid to take its time – I don’t think anyone spoke until 10-15 minutes in to the film. There are themes of mistrust and paranoia. Stephen Meek, the guide that the three families hired to take them through the desolate wilderness, proves himself increasingly useless, which turns the majority of the group against him. Around halfway through the film, the families capture an Indian played by Rod Rondeaux (who has the most pornish awesome name I’ve heard in a while). The group is torn on whether to kill him or bring him along, since he seemingly knows the area and where to find water. Michelle Williams, as young wife Emily Tetherow, is the nicest to him. “I want him to owe me one,” she says while fixing his boot. Bruce Greenwood, as the blustery and confident Meek, plays a great character, but all of the actors are solid. Williams, Greenwood, Paul Dano and Will Patton all disappear into their roles. Now that I’ve said all that, I have to say that the film makes it hard to get close to the characters and I feel like I never really came to know them. I feel like there were few intimate and/or close up shots of the actors, and between that and the somewhat scarce dialogue, I had sort of an unwilling fly-on-the-wall feeling throughout the whole film (more so than normal anyway). The film is in some ways about the relationship between men and women. Meek equates women to chaos and men to destruction at one point and his desire to kill the Indian and Emily’s desire to keep him safe sort of validates this. You could say that Emily’s goal produces chaos – the families are quite chaotic as long as the Indian is around (although chaos is sort of the norm in this film) – and Meek’s goal is destruction. Speaking of chaos and destruction, one of the most interesting scenes in the film is one in which the families try to get their wagons down a steep hill. The scene is pretty intense and leads to a great confrontation between Emily and Meek. I recommend the film as a one-time watch if you’re up for a slow recreation of what it was like to wander across early America. Don’t expect a cut and dry story with this one – the film’s ending will probably leave you unsatisfied. Nice review. Totally agree with all you have said. 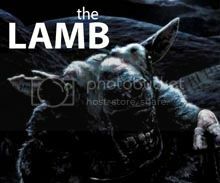 Its an obscure film, but one that is rewarding if approached with patience and attention. I like the fly-on-the-wall connection, because there was this observational quality about the camerawork. It was often from the women's POV, viewing the men from a distance, which makes Hatter's comments interesting too! Thanks for the read! I agree, the film can definitely be rewarding. It's not my usual cup of tea but it's very unique.